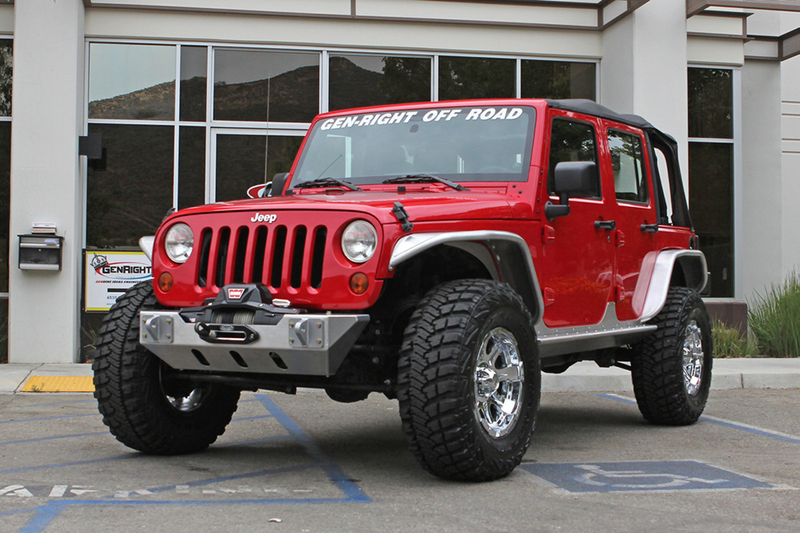 This is a 2013 Jeep Wrangler JKU we built to retain all the factory driving characteristics, but run a larger 35" tall tire. With many Rubicon model Jeeps coming with 4.11 gears from the factory, you can move up to a 35" tire pretty easily without having to re-gear the axles. We did this by simply adding an 1-3/4" puck lift, longer shocks, GenRight tube fenders, Raceline 17" wheels and 35x12.50x17" Goodyear MT/R tires. By doing this we did not have to change the driveshafts, steering or brake lines (which should be done for any lift over 2") and the vehicle drives just like stock! Shown here is our Aluminum "wrap" of product (FBB-8040 front bumper, RBB-8220 rear bumper, RCG-8014 rocker guards, TFF-8720 front flares and TFR-8020 rear flares). 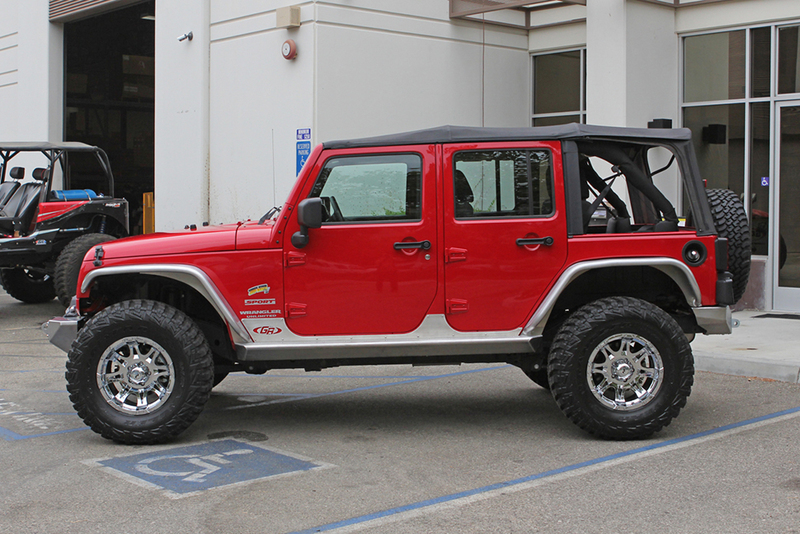 shown here with optional Raceline wheels, Warn Zeon winch and aluminum winch fairlead. 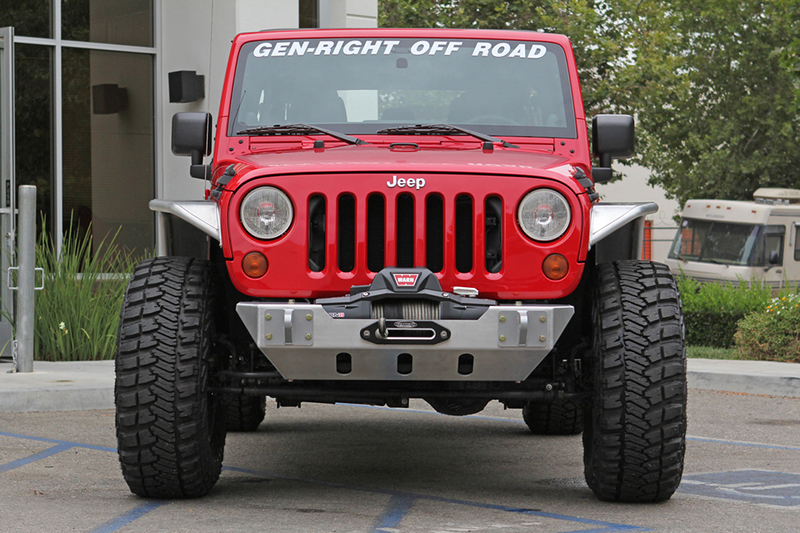 This front view shows how our high clearance front bumpers and fenders give the vehicle that aggressive off-road look. 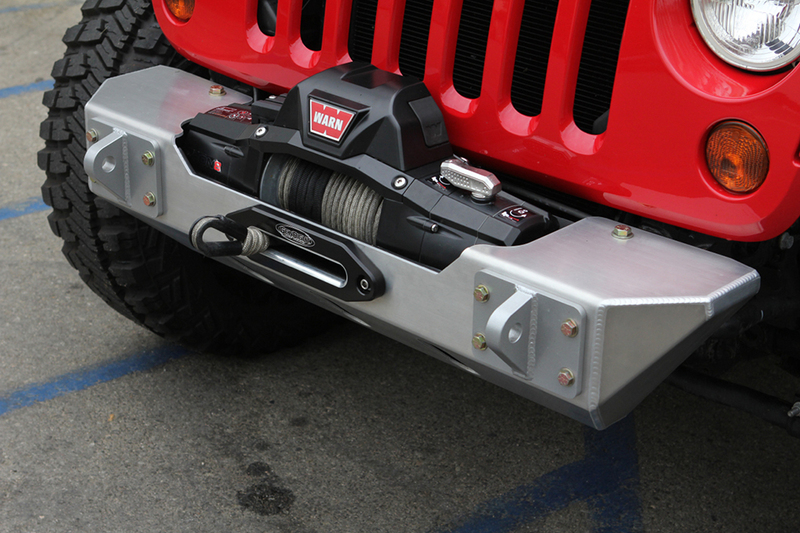 Here you can see the beefy steel tow points that are perfect for flat towing behind your truck or RV. You can also see how we recessed the winch down into the front bumper so we did not block any air flow to the radiator. The side view shows how much the GenRight tube fenders open up the wheel wells over the factory plastic flares. Check out this Stage 1 kit now!